I make no claims that moulds catalogued here are safe for all humans. This website is scientific only in the sense that I, Felix, represent a single data point. This does not mean a particular mould is safe. All it means is that Felix ate food that it touched once and survived. Felix surviving a particular mould does not mean you will survive it. You have been warned. I was exclusively breastfed as a baby. I was allowed to eat dirt, dust, whatever I could get my hands on when I was little, and so was my sister. I have no known allergies of any kind (I am one of the last humans who can make this claim, it seems...). I didn't start regularly washing my hands until I was in high school. This included after going to the bathroom, even public bathrooms -- my first clue that washing hands was something people did frequently was that Seinfeld episode where the cast makes a big deal out of it. I grew up constantly exposed to cats. I usually forget to wash/rinse fruit or vegetables before eating them. If food falls on the floor, I always eat it (unless it gets covered in hair/cat fur because I don't like those textures) -- even if it wasn't mine. I never use bandaids; if wounds are small enough not to require stitches, I lick them clean, wait for them to stop bleeding, and leave them as they are. ...and in case you're all wondering... I get colds maybe four or five times a year tops, and go years between more serious illnesses. The last time I was sick enough to barf was swine flu in 2009 (which really wasn't that bad). The two times before that were salmonella around 5 years ago, and an unknown hallucinogenic fever type thing induced by bad christmas cookies around 6 years ago. I started this project after being frustrated by the lack of any similar ones. 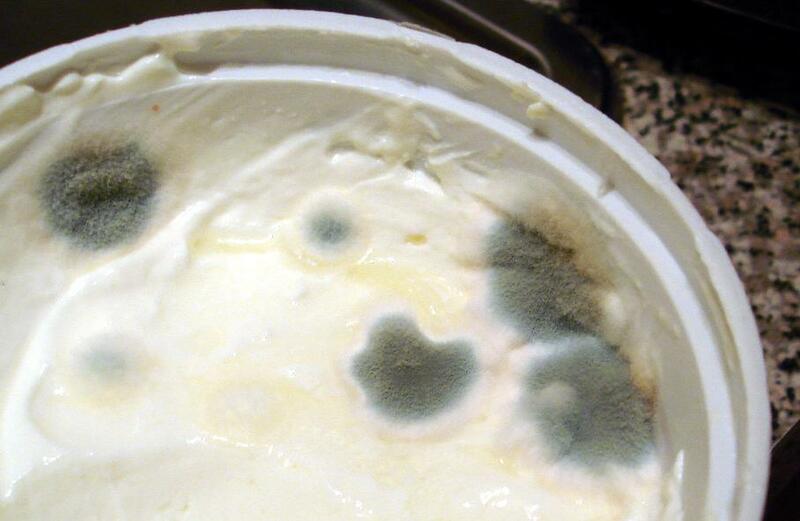 Pretty much all food advice websites say "if it has mould on it, throw it out!" This strikes me as silly, as humans wouldn't have gotten very far if we were that sensitive to mould. So, this page will contain a photographic log of moulds that are mostly harmless. Note that I am removing the mould from the food before eating the food; I'm not actually eating the (visible) mould. I try to effect this removal with as little chance of re-contaminating the rest of the food as possible; e.g. for liquids such as pasta sauce, my procedure is typically to rinse the spoon in hot water between each mould-scooping. For cheese, I cut away only the visible part of the mould. Many websites say that you have to cut 1 inch deep on any side that has mould on it because of "mould roots." Whatever. I wouldn't have any cheese left if I did that, so I cut only as deep as necessary to remove the visible mould (typically 1 mm depth). Food is rhubarb crumble. Time in fridge was roughly four weeks, I think. 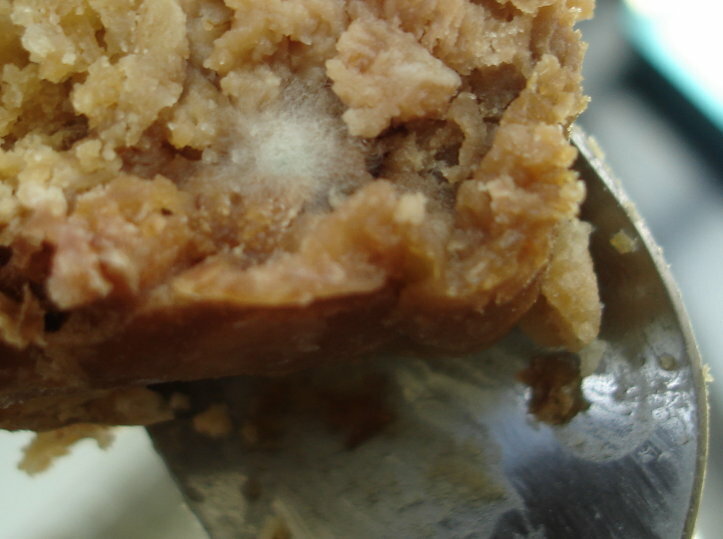 Mould resembles small cobwebs. Largest one was about 3-4 mm across. Black trace mould that forms on the inside of my bike's water bottle. 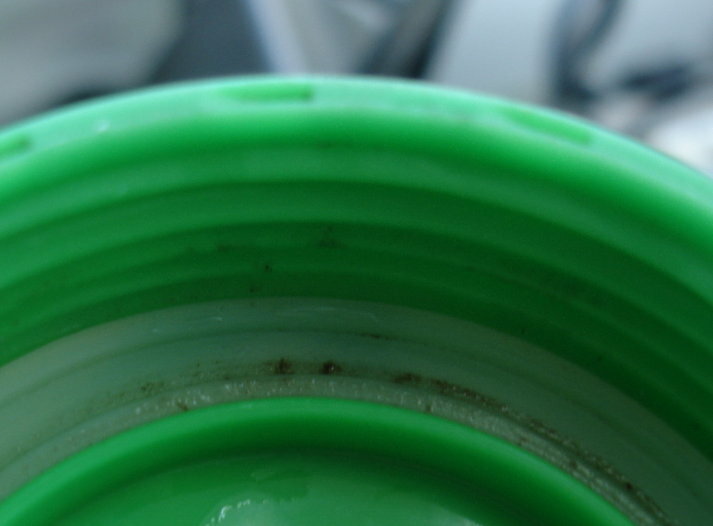 I don't bother to clean it very often; been drinking out of it for at least 2 years. 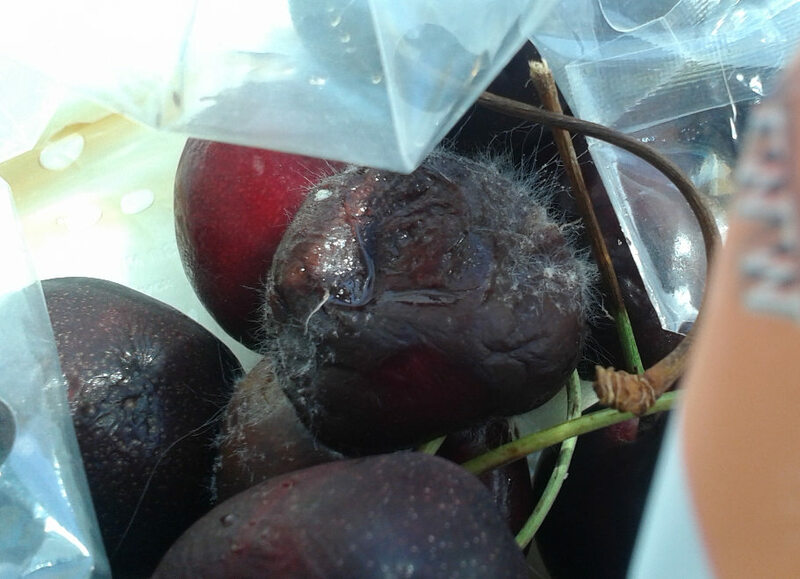 Small fuzzy grey mould forming around the inside of where the stem was on a cherry. 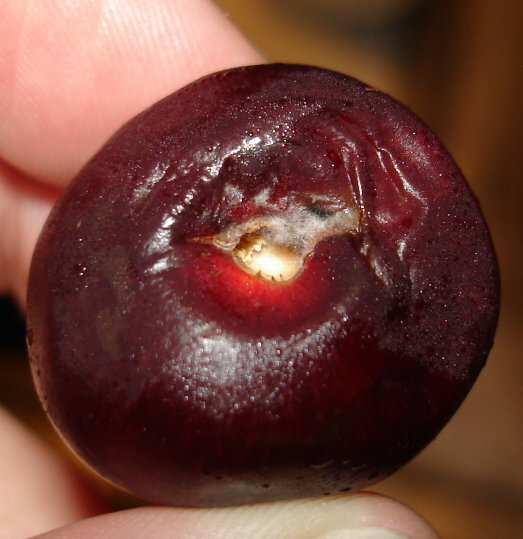 Note: I didn't bother cutting this out; I just ate this cherry with the mould on it. 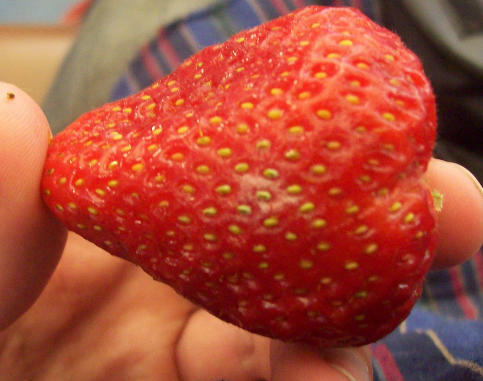 Small blotchy grey surface mould forming on a strawberry. Note: I didn't bother cutting this out; I just ate this strawberry with the mould on it. 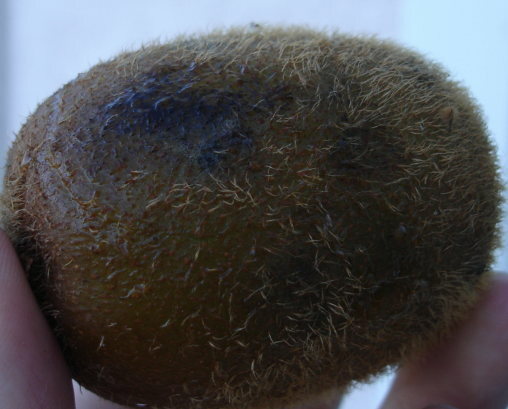 Wet black mould on a kiwi. This kiwi was packed in with a bunch of pea pods in a tupperware container. 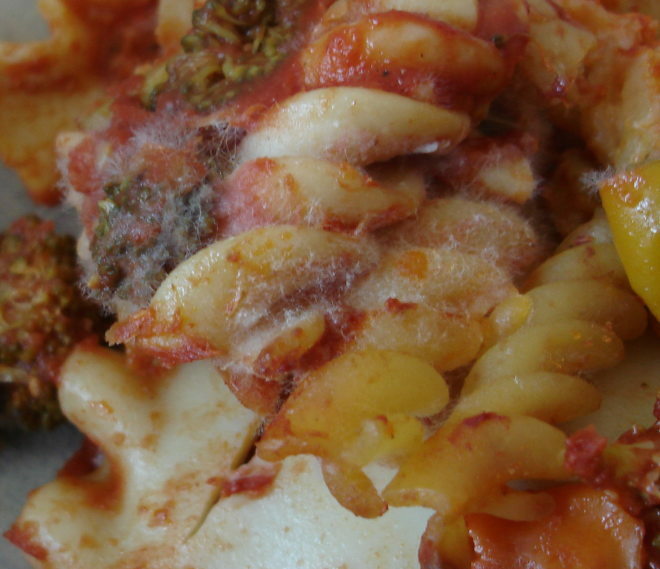 White fuzzy mould on old lasagna. This lasagna was previously dropped onto the floor in a fridge accident. 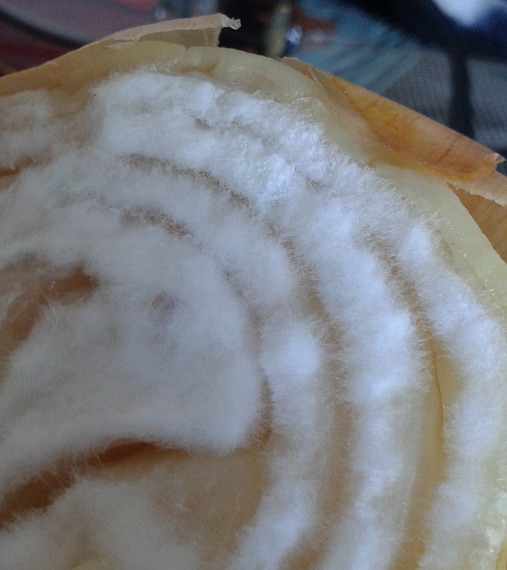 Blue/greenish mould on sour cream. 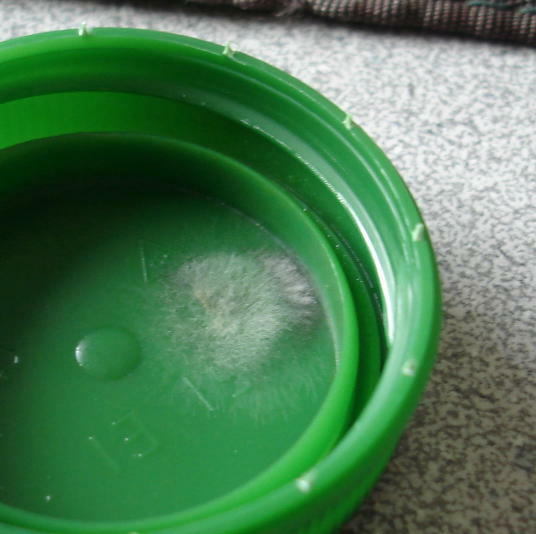 Grey fuzzy mould on underside of orange juice cap. Also, there was a mysterious gelatinous floaty thing in the juice that was probably a mould or bacterial colony of some kind. 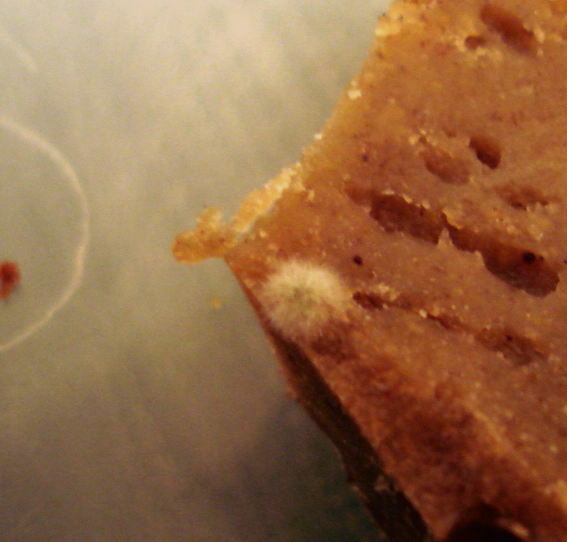 Small (4mm diameter) spot of mould on a fairly old slice of zucchini (and other random fruits & vegetables found in the fridge) loaf that had been kept moist by being in a tupperware container. 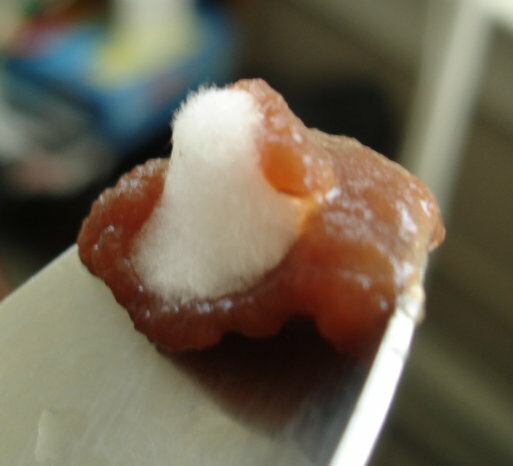 Filamented mould throughout a bag of cherries. I rinsed this off of the structurally intact cherries and ate them. Note that some of the cherries in the bottom of this bag had putrefied into liquid. I rinsed that off as well. 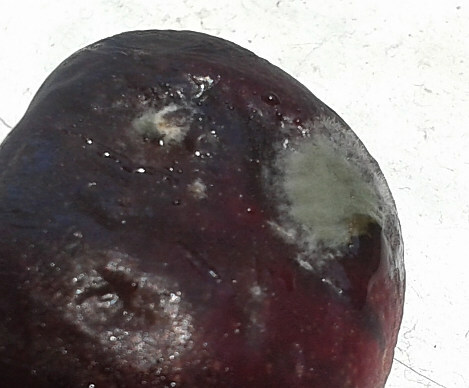 Velvety dark grey mould on a wound in a cherry (from the same bag as above; different mould species I think). Cut out of cherry before I ate it (the cherry I mean). 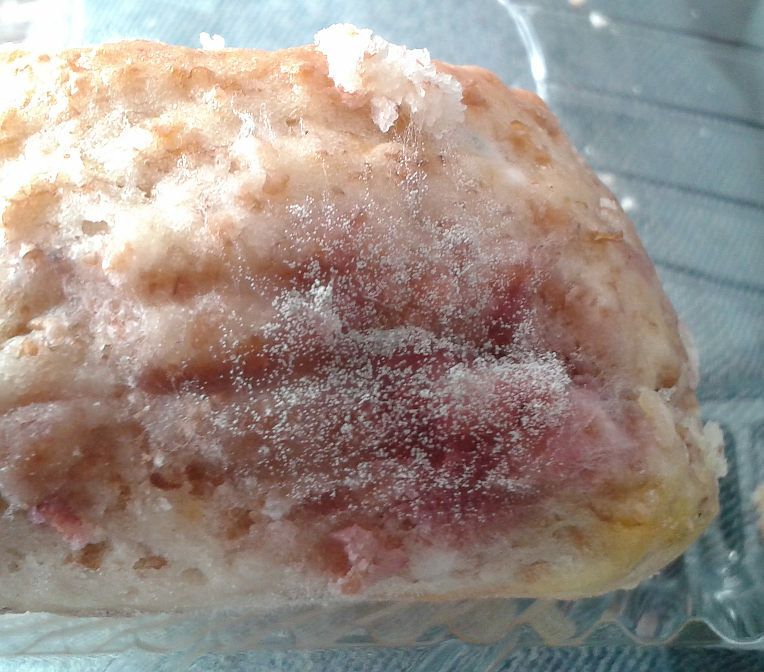 Stippled/speckly white mould with some filaments, on a raspberry scone. Snowy white mould around the rings of an onion.